I just checked out the new Robocop trailer. “Why is America so Robo-phobic?” is the phrase I plan on working into every conversation I have for the foreseeable future. This phrase is uttered by the badly rugged Samuel L. Jackson. So far in the 2:26 minute long trailer we see some awesome CG effects which stands to reason if you’re watching a movie about a cyborg policeman, or any movie made in 2013. Long gone are the days of non-computerized special effects. I generally dislike re-boots of perfectly good movies on premise alone. I still refuse to watch the new Footloose, my kids were forced to watch the Kevin Bacon original before I allowed them to watch the new one. They also had to sit through Ralph Macchio’s Karate Kid before they got to see the version all their friends talked about. However, this one may bring me around just for some of the casting choices. Michael Keaton, who is forever MY version of Batman, Gary Oldman who was amazing in The Fifth Element, my ideal Dracula, and Sid Vicious. Of course the quintessential voice that forever pops up in my head when I hear someone mention the movie Pulp Fiction, Samuel L. Jackson. 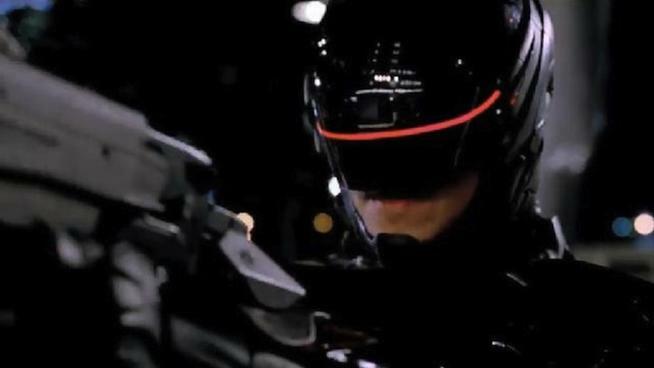 Robocop will hit theaters on February 12, 2014. Talk about a romantic movie for Valentine’s Day! This entry was posted on Thursday, November 7th, 2013 at 5:23 pm	and is filed under Film, News. You can follow any responses to this entry through the RSS 2.0 feed. You can skip to the end and leave a response. Pinging is currently not allowed. « Netflix Picks Up Four Marvel Live-Action Series & A Mini Featuring Daredevil, Jessica Jones, Iron Fist, Luke Cage For 2015 Launch!! !